Orange County Civic Center is the focal point for Federal, State, County and City government in Orange County. 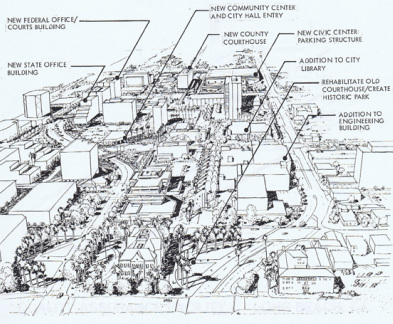 The Master Plan included establishment of a spatial needs program and a comprehensive strategy for development in the heart of the City of Santa Ana, located south of the City of Los Angeles. The center was projected to increase from 1.5 million square feet of government space to 2 million square feet. The plan incorporated an adaptive reuse of an historic Court House and relationship to downtown revitalization of this major city. Mark Hall was principal-in-charge for ARCHIPLAN urban design collaborative in joint venture with Kurt Meyer Partners.